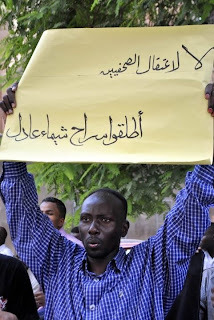 Egyptian Chronicles: #Sudan Revolts : 7 days and Shaimaa is still in Custody !! #Sudan Revolts : 7 days and Shaimaa is still in Custody !! Egyptian Journalist Shaimaa Adel is still in custody in Sudan and our activists are having nearly daily protests in front of the Sudanese embassy in soldiarity with her in Cairo demanding her immediate release. Already Shaimaa seemed to be facing a lot of trouble. Mohi El Din El Tatawy , the head of journalists Syndicate in Sudan told Al Masry Al Youm today that Shaimaa is facing charges not related to journalism according to the Sudanese authorities. This is not good , now Shaimaa can face whatever charges the dictatorship of El Bashir wants to accuse the protesters with including foreign support for the protests !! Shaimaa was arrested at internet Café in Khartoum last week while sending her second report to Al Watan Newspaper in Cairo. She entered Sudan and worked as a correspondent for Al Watan without taking a permit from the international press center or whatever it is called there or notifying the Sudanese embassy that she would go there to cover the protests. I know tomorrow there will be a protest in front of the ministry of foreign affairs in solidarity with Shaimaa. Please spread the word about Shaimaa , she needs your help. The vice president of Sudanese president Nafae Ali Nafae told journalists today in a meeting at Al Wafd Party during his visit to Cairo after meeting Morsi that we will hear good news about Shaimaa !! He also claimed that she was detained her house in Khartoum !! I do not know what kind of lies he is spreading but I trust my sources more than him. Already it turns out that some of the protesters and activists arrested during the protests are facing charges like receiving orders from the #Jan25 Protesters in Cairo to spread it in Sudan !! Here is Shaimaa's mom telling Al Wafd newspaper that she knows about her daughter for 7 days now !! "In Arabic"
MP Ali Fatah El Bab of FJ Party demanded in Shura Council today the immediate release of Shaimaa. The fantastic Gameela Ismail asked President Morsi to interfere immediate and save Shaimaa before she becomes as another Gizaway "The Egyptian lawyer who was arrested in Saudi Arabia and accused of drug trafficking, resulted in a diplomatic crisis"
Down with all these bloody dictators who jail people for having an opinion!!!!!!! The Gulf false monarchs are just the same! Agree. But why the USA don't call those "Gulph Monarchs" what they are?? ?dictators, like Mubarak, Assad,...etc,??? ?.